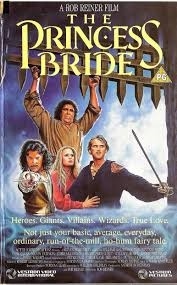 True love is the driving force behind The Princess Bride, a gentle spoof of the classic fairy tale. In the picturesque country of Florin, the exceedingly handsome yet humble Westley and the extraordinarily beautiful Buttercup – having quietly pined for years – finally conjure up the courage to express their great love for each other. But cruel fate intervenes, taking Westley far overseas where he tragically falls victim to the Dread Pirate Roberts. Years pass by and the still mourning Buttercup has no choice but to accept the hand of the ethically challenged Prince Humperdinck, although she will never truly love again. Dramatic chaos ensues as kidnappers proceed to make off with the fair maiden in an effort to disrupt the upcoming wedding. A black-masked pirate, a brilliant hunchback Sicilian, a vengeful Spanish swordsman and a gentle Turkish giant all struggle to gain the upper hand in this passion filled battle for love. Novelist and screenwriter William Goldman – Oscar winner for the Butch Cassidy and the Sundance Kid screenplay – first published The Princess Bride in 1973, adapting it from a previously published work by the great Florinese writer, S. Morgenstern. Goldman’s immigrant father read the Morgenstern version to his son often, planting a passion in the youth that prompted him to revisit the story as an adult. Goldman includes much of this autobiographical material in the book, interspersing it to great comic effect within the actual fairy tale. He’s also gone on to include additional back story in subsequent anniversary editions of the work, touching on the making of the movie version as well. Goldman’s storytelling is top notch, nicely balancing the heart-wrenching love story with panoply of silly fairy tale caricatures and inanities. A full review of the thoroughly entertaining 2007 edition can be read here. 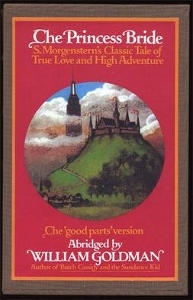 Shortly after the book was released, Goldman wrote the screenplay, but the project languished for years until Rob Reiner brought The Princess Bride to the screen in 1987. The movie gained critical acclaim and rapidly developed a bit of a cult following, driven by the imaginative, wholesome and quirky storyline. Highlights include a stellar ensemble cast and a hauntingly memorable soundtrack by Mark Knopfler. Reiner’s direction masterfully captures the whimsy of the original story, while keeping the focus on the love story and not letting the silly bits get too carried away. Wonderful cinematography by Adrian Biddle creates a Florin that’s impossibly quaint and believable in a fantastic sort of way. Equal parts fun and poignancy, the movie succeeds in every way. Given that Goldman wrote both the book and the screenplay, the two works complement each other rather nicely, but there’s one thing that puts the movie on top. The fantastic trio of André the Giant as Fizzik, Mandy Patinkin as Inigo Montoya and Wallace Shawn – sporting some lovely figure-flattering tights – as Vizzini are truly memorable and form the comic center of the movie. Add well done smaller bits by Chris Sarandon as the Prince and Billy Crystal as Miracle Max and solid performances by the two youthful leads and the book doesn’t really stand a chance. Moreover, Peter Falk and Fred Savage are inconceivably cute as the storytelling grandpa and his grandson. While Goldman’s wildly creative original book is well worth reading, the movie version of The Princess Bride is the clear winner this time around.